Cape Town Mayor Patricia de Lille on Wednesday described the scenario of the city running out of useable water as a “crisis of catastrophic proportions” and warned that water scarcity was now the “New Normal”. In a speech to a full Council on Wednesday, De Lille said that over many decades, engineers and planners had built the water supply infrastructure in the city and in the surrounding areas which had served the city well and had previously navigated Cape Town through drought periods. “The drought we are currently experiencing is the most stubborn in recent history,” she said. “It is a significant shock to the fabric our city and accentuates many other underlying stresses such as urbanisation. “Water is not to be taken for granted,” she added. “To run out of useable water is to be presented with a crisis of catastrophic proportions. De Lille said that as per practice over many decades, the city had relied on winter rainfall to replenish the dam system that supplies the city’s water needs but that changing patterns meant that even this was no longer a guarantee. “Two days ago we announced that dam storage levels are now at 19,7%, which is 0,8% down from a week ago. With the last 10% of a dam’s water mostly not being useable, dam levels are effectively at 9,7%. De Lille said the current situation called for making certain decisions in the context of unpredictability. “We cannot be sure whether it will rain this winter. We have gone through May with nothing much to show with regard to rainfall,” she said. “June might be better, but the point is we do not know. The confidence in weather prediction is low. “We need a new relationship with water. The days of plentiful water supply in Cape Town may very well be over,” De Lille added. “And even if abundance emerges in one or two years from now, we cannot be sure it will last. Times of abundance should be regarded as the anomaly in the system, not times of scarcity. 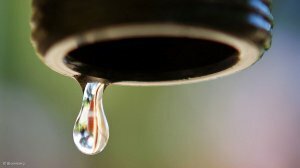 On Tuesday, the City of Cape Town warned that Capetonians using more than 3,500 litres of water a month could expect to see a whopping 19.25 percent increase in their water bills from July. The announcement came from De Lille who tabled the City of Cape Town budget on Tuesday. De Lille said Capetonians had progressively reduced their water use down to a daily use of about 666-million litres of water, against the current target of 600-million litres. “I am disappointed that the target is not being met, and I know there is room for improvement from many people who may not yet understand the serious situation this city is in,” she said. She said the “New Normal” for the city was an opportunity to “significantly change our approach to water”. The City Council was due to consider a move to Level 4 water restrictions on Wednesday which would prohibit the use of potable water outside of the house and De Lille called on residents to not use more than 100 litres of water each per day. De Lille said the city was in a critical situation and residents and businesses needed to push even harder and reduce water usage city-wide to 500 million litres of water per day.